“The Guard charges” Napoleon gave special attention to this splendid unit – the Imperial Guard – and it became a sort of little army within the “Grande Armée”. This study of its organisation is here at its most erudite, like the one on the uniforms and equipment. Discover the uniforms, the equipment, and the weapons used by all those “Grognards”, who were launched into a battle as a last resort, at the decisive moment. Explaining how the Guard was organised into Old, Middle and Young Guards, in this volume, the illustrator-researcher André Jouineau shows the colonel-generals, the grenadiers, the chasseurs à pied, fusiliers, velites, flanqueurs, wards, workmen, sappers, doctors, magistrates and foot gunners; in the second volume he shows the centaurs of the Guard’s cavalry. This small practical, clear, concise, logical and visual tool is a real vade mecum, intended for imperial history buffs as well as figurine makers. The third volume – a compilation of two dossiers published in the fifth and sixth issues of the magazine ”Soldat” – is the new, improved, entirely revised and re-drawn larger version (more than fifty per cent more characters) than the previous work published several years ago now by the authors. 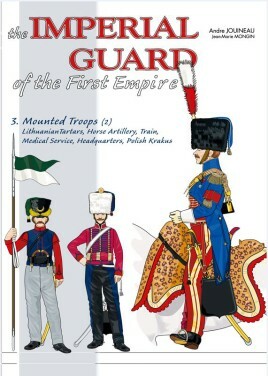 In this volume : the last mounted units of the Guard, the follow-up units, the Horse Artillery, the Artillery trains and teams, the Health Service, the Guard HQ Staff but also the Emperor’s Household, the Emperor and the first uniforms of the Royal Guard.